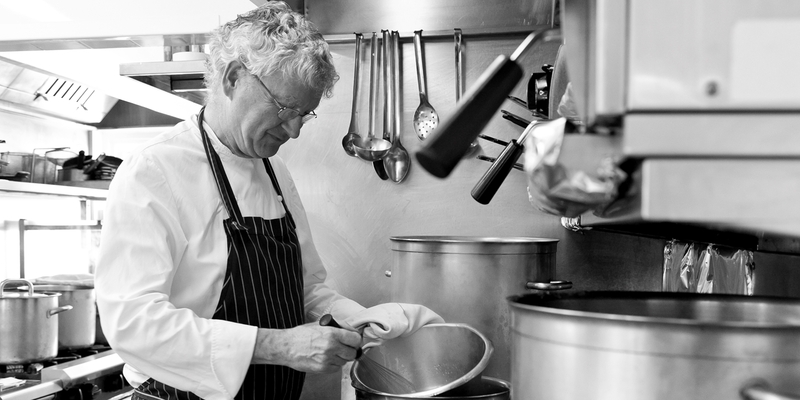 Shaun Hill has spent nearly 50 years in the kitchen, heading various Michelin-starred eateries over his long career. As a one-man brigade at The Merchant House, he put Ludlow on the culinary map, and at his new enterprise in Wales he continues to delight with his unpretentious, gorgeously flavoured, market-driven plates. Next came a position with Robert Carrier, a prominent food writer at the time, at his eponymous restaurant. Serving rustic (though expensive) Mediterranean food – still something of a novelty in 1960s London – Shaun Hill says of his time there: ‘I loved it there and the lessons learnt have stayed with me.’ He went on to a spell at The Gay Hussar, the legendary politicians’ hangout in Soho and self-declared ‘only Hungarian restaurant in England’ before moving on to work at some of London’s most prestigious restaurants, including The Capital Hotel in Knightsbridge (under Brian Turner) and Blakes in South Kensington. One of the most significant highlights of his long career came in the 1980s, when he was head chef at Gidleigh Park in Devon. 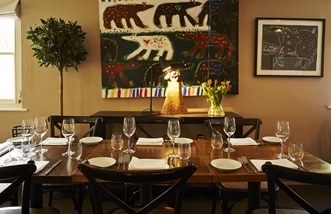 Cooking here for nine years, with a Michelin star for much of that time, he was a key player in the ‘Modern-British’ food movement of the late 1980s that fused local, seasonal produce with global influences. Writing at the time, The Independent celebrated his introduction of international, often spicy, flavours to traditional haute cuisine, describing him as ‘one of Britain's most extrovert chefs, with an exuberant style greatly admired by his peers … He is both curious and gregarious, and a passionate spokesman for good produce, he goes to extraordinary lengths to track it down.’ Notable dishes of this era of his career included Calves’ sweetbreads with potato and olive cakes, and Red mullet with ginger, garlic and tomato – both of which make a reappearance, in some form or another, later in his menus. In 1994 Shaun Hill and his wife Anja opened The Merchant House, their legendary and much missed 24-seat restaurant in Ludlow, which earnt them a Michelin star – the second of his career. 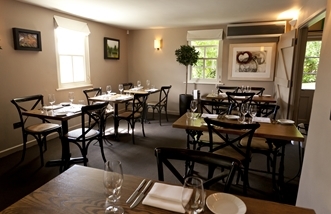 At one time hailed as the 14th best restaurant in the world by fellow restauranteurs and critics, The Merchant House turned the Shropshire market town into a gastronomic destination. His time there will be remembered fondly by anyone who was lucky enough to have eaten his outstanding dishes, cooked personally by Hill – the sole member of the kitchen brigade. Although very much a ‘market-based’ menu, with Shaun Hill choosing his produce personally from the best available that day, many of the dishes he had perfected over the years were again featured and his calves’ sweetbreads were received with even more enthusiasm here than they were at Gidleigh Park. Other similarly acclaimed dishes included Steamed lobster with chickpeas and coriander, Wild duck with celeriac and morels, and desserts such as ‘somlói’ – a Hungarian apricot and rum trifle which he picked up while working at The Gay Hussar. Closing in 2005, by then The Merchant House had established a reputation as ‘one of the most respected British restaurants of the past decade’, as described by Jancis Robinson. Both Shaun Hill and his wife Anja wanted to retire from the grind of daily service – Anja to focus on the bread-making she had started at The Merchant House, and Hill, feeling that he had achieved all he could in that small kitchen, to become a restaurant consultant. But the pull of the kitchen was too strong. In 2008, he succumbed to an offer made by local hotelier William Griffiths, who had worked for him as a young man. The well-loved Welsh restaurant The Walnut Tree, where in its glory days was a regular haunt of Hill, was on the market and Griffith wanted to renovate. He would take care of the admin and Shaun Hill’s domain would be the kitchen. Often describing himself as ‘the rough side of Michelin’, his plates eschew precise, laboured arrangement and decoration. But what his food at The Walnut Inn does offer is the same unbridled deliciousness of his other Michelin-level venues – plates that display his innate understanding of beautiful ingredients, prepared with a restrained hand in his timeless and distinctive style. Rejecting the nostalgic and fantastical view of British cooking as that from the Dickens era, Shaun Hill has always interspersed his cooking with travel and collects inspiration wherever he finds it – be it a recipe to tweak, a combination of ingredients or a new cooking method. He told Andy Hayler: ‘My favourite ingredient tends to vary wildly depending on what book I have recently read or where I have been on holiday. Last year’s trip to Kerala saw more tamarind and coconut milk than was good for me.’ His Steamed John Dory with potato rasam – sweet, meaty fish with an Indian-spiced potato soup – bears the hallmarks of this trip. Frequently referred to as ‘a chef’s chef’, he is looked up to by many of the very best in Britain’s restaurant industry, with Tom Kerridge describing him as ‘an inspiration’. With nearly 50 years in the kitchen behind him, he continues to both satisfy and delight, still producing ‘food you want to eat yourself’, executed with intelligence, deftness and unparalleled integrity. When Shaun Hill took over The Walnut Tree Inn in 2008, he wasn't just acquiring a road-side pub in a beautiful rural Welsh setting. Between 1963 and 2001, it was a genuine culinary landmark run by pioneering chef Franco Taruschio but had more recently fell on hard times.